Three hundred sixty-five days ago, I was bedridden with acute bronchitis that originated with the flu, which resulted in a chest-wrenching case of pleurisy and a severe flare up of a sacroiliac joint dysfunction. I spent that day crying each time I coughed up a lung or cringing from each spoonful of medicine I detested having to swallow. I recall this exact date because it was my 40th birthday. That was one year ago. Today is my birthday. 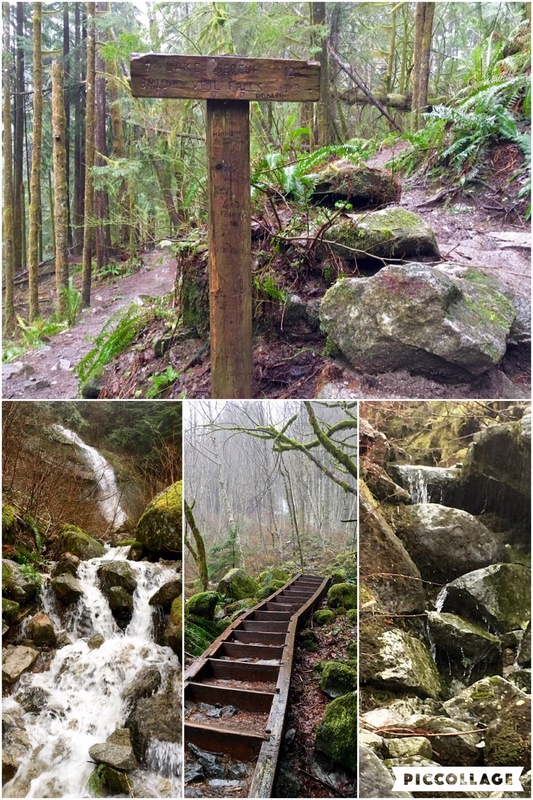 Instead of succumbing to a minor case of the sniffles, I spent this morning hiking my 16th trail of the year. Since it’s also Hallmark – ahem, I mean Valentine’s – Day, I thought Lake Serene and Bridal Veil Falls would be most apropos for today’s solo hike. In our home, my birthday trumps that of any contrived celebration, so it was my choice to spend this morning alone. If you shared my birth date, you would also understand the desire to survive this “holiday” on your own (and after a decade together, my husband now sympathizes). Not to worry, I was still spoiled rotten with dinner, flowers and cards by my loving husband and daughters. Following an easy drive north on I405, I arrived at 8:30 am to a muddy lot stacked with several cars. A few couples and groups also planned to spend the morning enjoying the serenity of this trail for their Valentine’s Day. 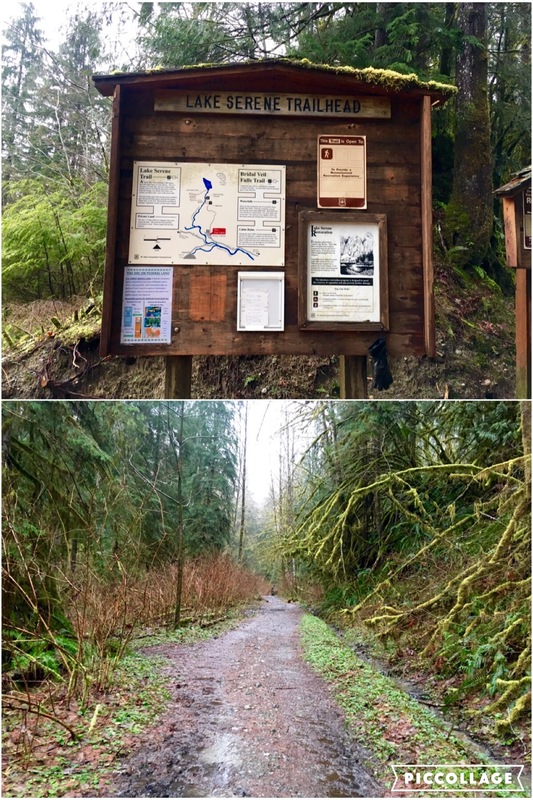 Lake Serene Trailhead was exactly as I remembered from my visit in September with Little Hiking Buddy: a former logging road up a gentle slope loosely paved with muddy gravel. But, that was about all that was the same, and I now regret silently snickering at LHB for all those “streams” she counted back then. She was right. Boy, was she ever right! 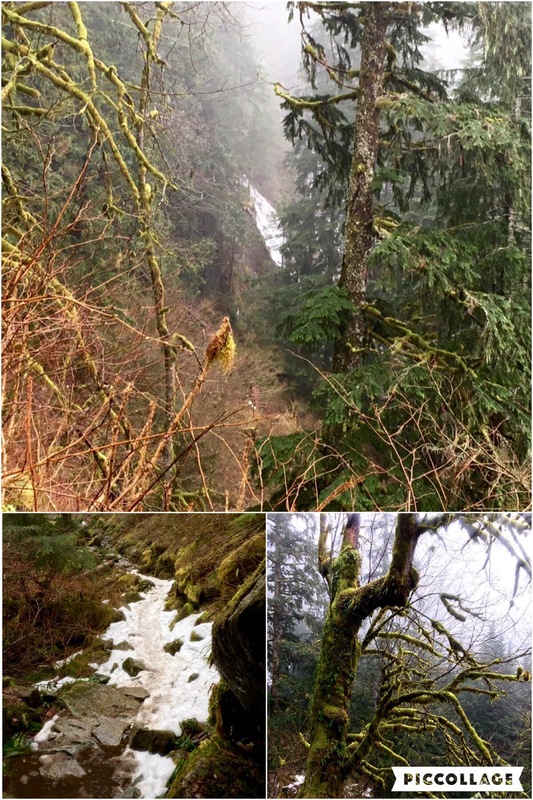 Following a severe winter, today’s hike was an endless wade through veritable rivers fed by perpetual waterfalls. After a quick tromp along the old road, I entered a deep forest filled with moss-covered trees that offered some brightness on this dreary morning. The canopy of limbs above provided a little shelter from the savage beat down of rain, but not as much as I would have hoped for today. Nature plays no favorites, and I certainly didn’t do anything to earn a reprieve from the showers, even if it was my birthday. Every step I took involved either a careful crossing of cold, rushing creeks or a sinking stomp through thick, gooey mud. I was so glad I wore my higher cut winter boots and gaiters because I spent most of the day ankle-deep in water! I found myself at the junction between Bridal Veil Falls and Lake Serene after 1.7 miles of rock hopping and stream jumping. 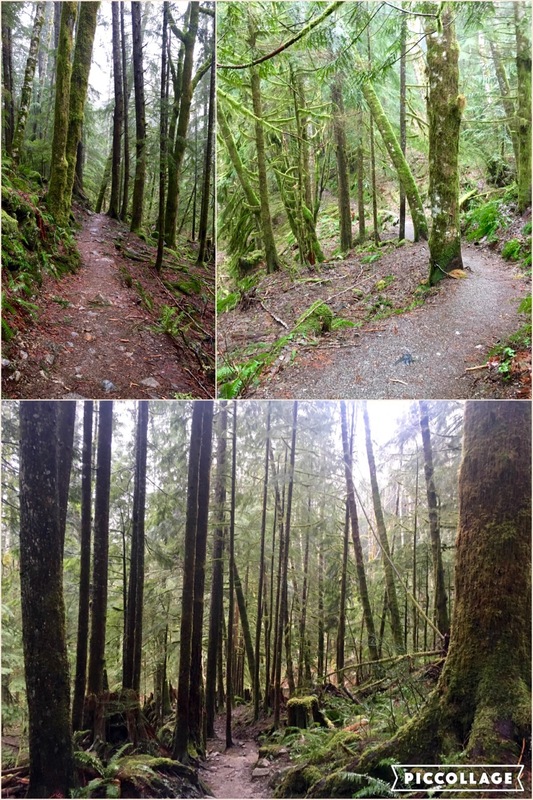 Since there was no snow on the lower trail and the total elevation was lower than my typical weekend hikes, I decided to take the half-mile up to Bridal Veil Falls Lookout. 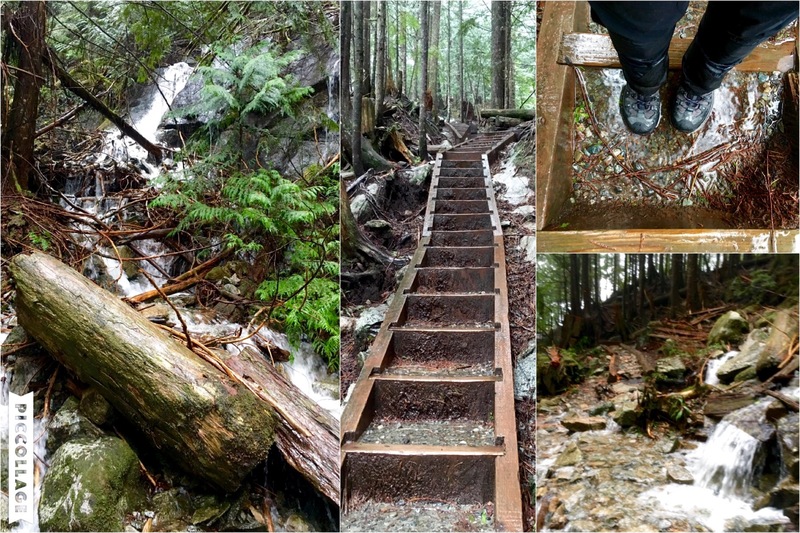 I had completely forgotten the ceaseless number of stairs to the Falls – that is, until I saw the first set, wherein flashbacks of me and LHB bemoaning each step up came back like a bad dream. 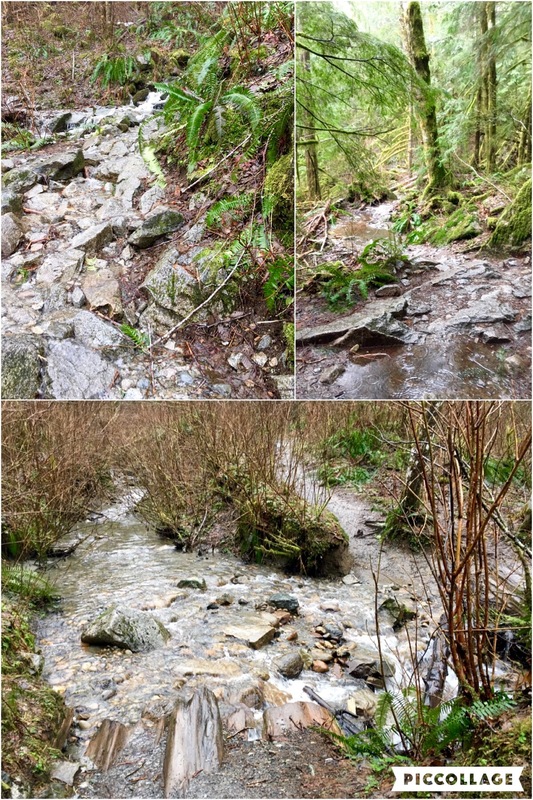 Although I made it easily to the base of the upper cascades, it was still a waterlogged trek over slick boulders, gnarled roots and puddle-filled stairs. Bridal Veil Falls was in full effect today, with every crevice, edge and slope covered in sheer liquid lace. I spent just a few moments walking through the loop, retracing my previous steps with LHB, before returning to the intersection with Lake Serene Trail. Once I made my way back from the upper viewpoint, I followed the trail down the mountain to the true base of Bridal Veil Falls. I first crossed a beautiful bridge that was spared damage from several felled trees, whose same trunks and limbs obstructed much of my view. After heading into the forest, the trail weaved me back directly under the Falls. I found myself questioning whether I should actually cross such deep waters with so much weight on my back. What if I slipped? Okay, so what if I slipped? I would just get wet at that point since I was merely on the flat ground of the lower splash pool. With that, I uneventfully waded through the pool onto drier land. A fallen trunk from a storm long past. Not sure I wanted to be anywhere near that in case it decided it didn’t want to hang around any longer. 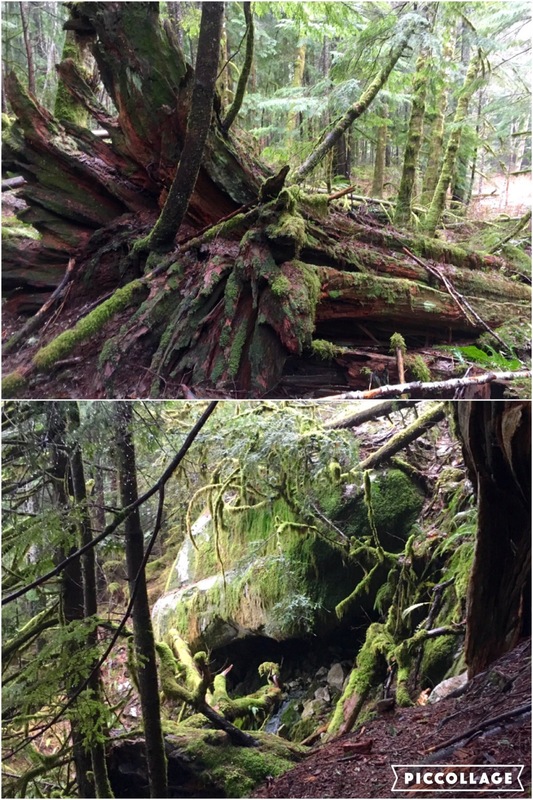 Once I made it out of the forest, I found myself hiking past an exposed talus slope thickly covered in crusted snow. With the recent warming of temperatures, the snow had settled higher up, but had been turned by previous hikers into slushy ice along the trail. Even with snow everywhere at this elevation, I could hear water running all around me. There were flows cascading down from above that crossed under the dense layer of snow. 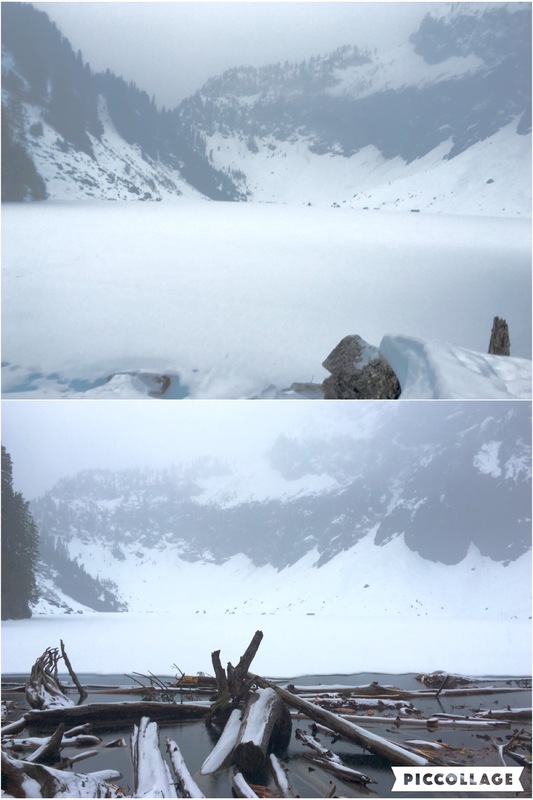 I finally put on my crampons and took out my poles for added traction throughout the remainder of my trek to Lake Serene. What a difference! I made it to the Lake in no time – well, just in time to regain some cover from the heavy rain that began to intensify soon after I reached the shoreline. Although it was a wretchedly wet day that fogged in much of Lake Serene, it was still something to experience. My initial views of the Lake centered on the log jam ahead of me, with a narrow, frost-covered footbridge that stood between me and true enjoyment of the promised serenity. Following tracks left by previous hikers, I quickly balanced my way across the opening and found the snow-covered trail once again. I set up my “picnic camp” and walked around the area to get a fuller view of Lake Serene. She was completely covered in white, as was the basin surrounding her. Although Mt. Index was obscured by the heavy rain and mist, I could sense the enormity of the cliffs opposite me. 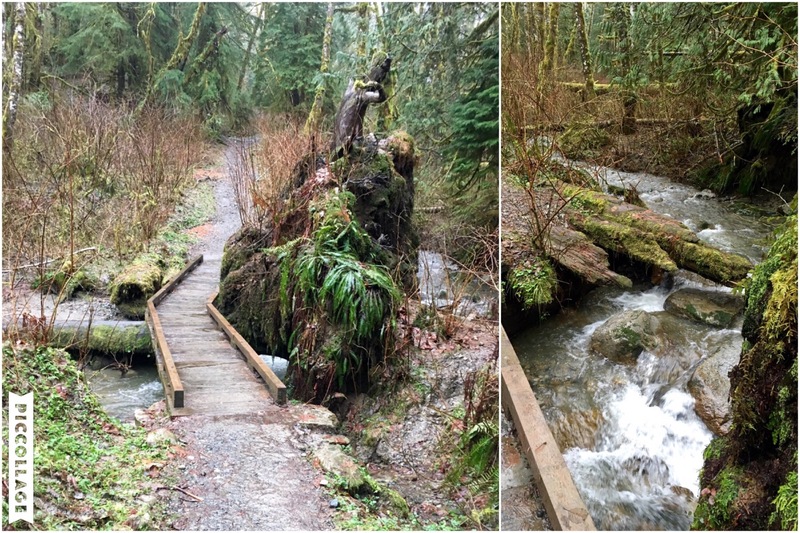 Footbridge over logjam and crossing that fed waterfall just before (pictured above). As I laid out my JetBoil, a trio of hikers came to the nearside of the Lake. With relentless rain coming down on us all, they decided it wasn’t worth the effort and left soon after their arrival. I was starving, cold and already wet. I didn’t care about the heavy precipitation at this point. While my water was boiling, I pulled out an extra down jacket from my pack and put it on as an insulating shield between my soaked thermal layer and drenched outer shell. A hot meal of reconstituted pasta primavera, miso soup and white chocolate mocha was just enough to get me hiking-ready again. How did I ever survive this winter hiking season without a JetBoil? Knowing I had one mile less on my return than on the way in, I headed down the trail with all the speed I could muster under the weight of my pack. I didn’t need the snowshoes after all, but it was good training for the upcoming backpacking season. At least that’s what I tell myself. As I ran into hikers coming up the mountain with barely anything on their backs – and far less on their bodies – I wondered if they realized what they would soon encounter. A few people stopped me to ask about the remaining distance, whereby I also offered information of trail conditions; but, even then, it was too late for most to do anything about their situation. Okay, so maybe it’s worth trekking up with a heavy load of potentially necessary items. Again, at least that’s what I tell myself. By the time I made it back to the lot, I was soaked through to the bone. Nothing is waterproof. Let me repeat that. NOTHING.IS.WATERPROOF. My awesome boots, which have kept me sane throughout this wet season, squished like sponges with every step; my dependable rain pants and jacket were like soggy towels that could wring out bucketfuls of rain; and my gaiters, though still successful in keeping mud out, couldn’t prevent flooding waters from filtering up through my socks and shoes. Thank goodness for an extra set of dry clothes in the trunk of the car! It didn’t matter, though, because I would soon be treated to an amazing birthday dinner out with my husband and junior hiking buddies, ensconced in their warm hugs and silly kisses. As soggy as it was, today was the best birthday ever.